Fitzwilliam Darcy Horatio Growltiger Howland, known commonly as Mr Darcy, and sometimes as Mr McWhorter, the Wedge, Grandpa Wedge, and the Powder Burned Piece of Pie, was a Seal Point Siamese who came into my life Memorial Day Weekend of 2001. A friend of my next door neighbor's found him abandoned in Lowes' parking lot. My neighbor, who rescued many animals, knew I wanted a cat and brought him to me. The vet estimated that he was between six and eight weeks old. He quickly wormed his way into everyone's affections - he was gregarious and outgoing and loved everyone. Everyone who met him loved him too, even those who didn't normally like cats. At the end of that year we moved in with my friend and her cat, an orange tabby named Mr Beckerby. 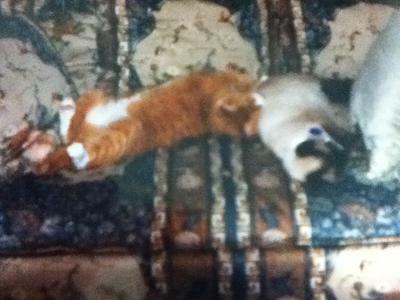 They became fast friends and loved to sleep together. Mr Darcy would regularly pin Mr Beckerby down to give him a bath. When we moved to separate places after five years, I thought I might need to get another cat, but Mr Darcy took to being an only cat in his stride. Another roommate introduced Mr Darcy to ferrets. He loved to play with them but they would gang up on him. He had a few puppies in his life also and he quickly tamed them. He became Grandpa Wedge when my sister got a kitten when he was about nine years old. She pestered him when we visited, but he didn't mind. He stayed there for three weeks once while I was in Europe. Little Inch was sick part of the time and he took good care of her. Mr Darcy was famous at work; everyone knew who he was. I had a party at my house once and most people were excited to come just to meet Mr Darcy! Those who knew cats were surprised that he hung out with us rather than hiding in the bedroom. Last January Mr Darcy had to have emergency surgery because he got hold of a Christmas ribbon and swallowed it. When he was in surgery it was discovered that he had lymphoma. In a way, that surgery was a blessing because it allowed me to find out about the cancer early before he actually got sick. He started seeing a great veterinary oncologist. He was much admired at the oncologist because he was so handsome and sweet and they were always excited to see him. We had him on chemo for awhile until it caused him to stop eating - he started losing weight and energy in April. 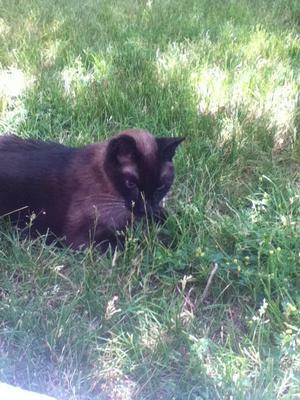 We spent lots of quality time together, including supervised trips outside since he no longer had the energy to run off. By the end of May he was skin and bones and had no energy. On June 6th he could no longer walk properly and we took him to the vet for the last time. He died peacefully surrounded by me, my sister and brother-in-law and my friend, Mr Beckerby's mom. Mr Beckerby died two years ago and I know they are together in heaven now. Thank you, Julie, for this lovely memorial to Mr Darcy (and what a great names - both Mr Darcy and the longer version, too.) 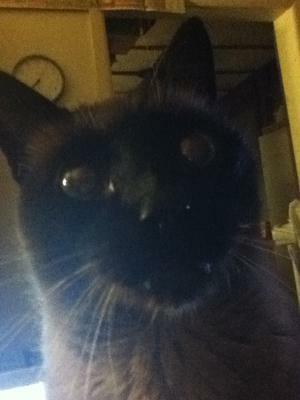 He was a beautiful cat by the look of him, and even darker than my own Seal Point boy. I've never heard of a Siamese cat living with or playing with ferrets before. Dogs, yes, cats, yes - but ferrets? Fascinating! And yes, Siamese cats are very good at taming puppies - in fact they're good at taming most dogs. You must have been devastated when he got sick, but it sounds as if he was very well-cared for and able to enjoy his last days with you. I love the picture of him outside in the grass and the sunshine. I am so sorry to hear about your loss. These beautiful creatures are such a big part of our lives that it is never easy to say goodbye to them. We lost our Chocolate baby last Sunday, she was 18. When people tell me she lived a long time, that may be true, but it is never long enough. I know God has a special place for them and that they are having an amazing time together. I know you've heard this before but it will hurt less as time goes by. Mr. Darcy deserves his time alone with you, please don't rush your days or run from your grief. I recently lost my long time best friend and it hurts terribly, family and friends don't understand, none have been close to a Meezer. We'll only have this one opportunity to grieve our lost companions and they are worth our pain. I wish you the best.